Handball is the most popular indoor sport in most European countries and as one of the fastest sports worldwide, continues to rapidly increase in popularity. The EHF EURO’s feature the best 16 top men’s and women’s teams from across Europe and take place every two years in January and December respectively. Infront offers media rights for 47 first-class games of the EHF EURO competitions and qualification rounds on a worldwide basis, (TV, radio, online) and provides tailor-made commercial packages for sponsorship partners. Covered by up to 15 cameras and special effects equipment - to show the whole beauty of the game in full HD, a state-of-the-art production provides a live TV signal is available on international satellites and ready for webcast, archive or news usage via ftp access. As the exclusive media and marketing partner of the European Handball Federation (EHF) for the EHF EURO events, Infront has secured TV coverage in 175 territories and top international sponsors. In addition, new technology will give referees more control over the game, while tailored digital solutions developed by both EHF and sponsors will enable deeper engagement of fans worldwide. Infront, as host broadcaster, will have a dedicated expert team both on- and off-site and will contribute to the TV broadcasting of live action into 175 territories by at least 130 media outlets. 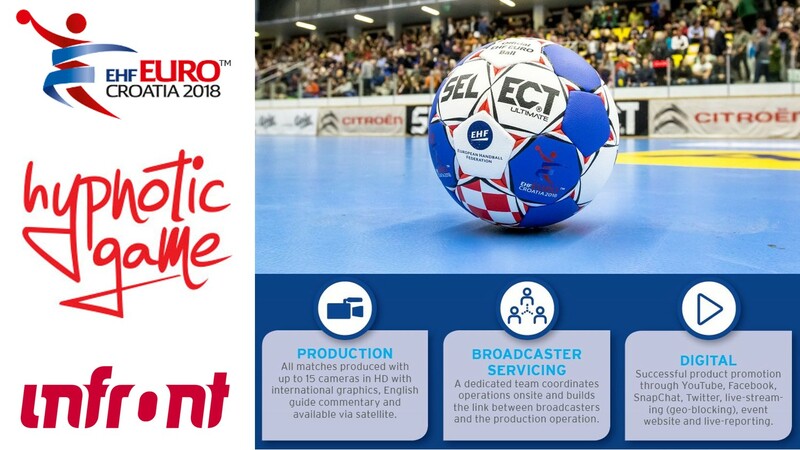 Alongside core handball markets in Europe, the event will be broadcast live throughout South, Central and North America, as well as to the UK, Georgia, Ukraine, Armenia, Azerbaijan, Moldova, Kazakhstan, Kyrgyzstan, Turkmenistan, Tajikistan and Uzbekistan. Mediacam works in the field of the broadcast television facilities alongside the most important television networks and media production companies. Mediacam managed to get a great success through the productions thanks to its experienced team who reached a great knowledge over the years and thanks to the latest update technologies that Mediacam provides to its customers. The company fleet includes multicam HD and 4K OB-Vans from 4 to 24 cameras ables to deal any kind of production from the entertainment shows format to big concerts and sports as football games, motorsport races, winter sports events, cycling, tennis and more. Grass Valley has supplied Studio Berlin with a suite of equipment for its outside broadcast (OB) trucks and TV production studio facilities, including 41 LDX 80/82/86/86N Series Cameras and LDX C80 Compact Series Cameras plus six K-Frame Video Production Center switchers capable of producing in 4K UHD. The camera purchase is part of a three-year contract with Grass Valley. Studio Berlin is planning to substitute a significant total of 70 LDK Cameras with the new LDX models within that period. German system integrator Broadcast Solutions GmbH was building the 19-camera 4K UHD OB truck that is based on Broadcast Solutions’ successful S16 Streamline series, and has a large Grass Valley 4K UHD K-Frame switcher on board, whose resources are shared between a 3-stripe Karrera main panel and a 2-stripe GV Korona subpanel. TVSTART is ready to provide a full range of production services. TVSTART offers any broadcasting facilities from equipment rent to the organisation of a full TV production and live transmission of any event with a including creative staff. The main office is based in Moscow. Nevertheless TVSTART provides services in any region of Russia, Belarus, and Kazakhstan. Having a production experience as the host broadcaster of the European Shooting Championship in Slovenia TVSTART is ready to provide services also in Europe. Using fly pack equipment TVSTART is able to produce any event in any country. In the early 80s, producing television was cool. The trucks came from New York City with the gear to make our TV. Kids pressed their faces to the fence – begging for swag. Pressure came with the job and everybody smoked. Six cameras was a big NFL show. The equipment was finicky and required constant tweaking. It was in this environment that I began my network career. Fast forward to today and I am known as the Admiral. A blatant rip-off of a famous Halsey … but I’ll take it! I’ve engineered on hundreds of big shows. Augusta. Super Bowls. Olympics. I’ve even been lucky enough to be on the crew of some Emmy Award-winning sports productions. The smokes are gone … but so are the kids at the fence. The wonder of a TV Truck has been replaced by the toys. The iPhones and iPads. The GoPros. The truck in a box. This is how kids view Television Production today. Anybody can do it. But they are wrong. Based in Colombo, capital city of Sri Lanka, national broadcaster Hiru TV gets Sri Lanka’s first HD OB production vehicle that was designed, built and commissioned by Hitachi. This vehicle’s concept, based on OB-BOX™, is a milestone for Sri Lanka’s broadcast market. OB-BOX™ - a patented concept that is a compact, modular and expandable OB system solution and facility. OB-BOX™ is delivered to the customer on its own and then it can be mounted on any type of vehicle chassis with proprietary fixing kit. OB-BOX™ can be mounted on any suitable vehicle chassis or on a trailer so any kind of vehicle can be used for transportation. Riedel Communications' MediorNet, Artist, and Bolero are playing major behind-the-scenes technical roles at the National Theatre in London, and Riedel is looking forward to revealing that story in early 2018. But, as the year starts to wind down, the company is pleased to announce that the theatre is using the same Riedel products as stage props in its highly anticipated stage adaptation of the 1976 television news satire "Network." "Network" is the story of Howard Beale, an out-of-control news anchor played by Bryan Cranston of "Breaking Bad" fame. The movie was widely regarded as ahead of its time in 1976, when it won four Academy Awards. The stage adaptation at the National Theatre, directed by Ivo van Hove, is true to its roots and remains incredibly relevant even 40 years after the movie's premiere. 22 Sony studio cameras, including eight HDC-4300's 3x XVS switchers and more than 200 monitors, including OLED screens, were selected to give BBC Studioworks its 4K capability and help make its Television Centre facility the most up to date and flexible studio space in the UK. Sony’s technology was selected not only for the all-in-one solutions package it offers, but for its open standards approach. Acting as an enabler for 4K technology, Sony’s IP solution works harmoniously with the infrastructure within the Television Centre studios, avoiding any disruption to the company’s established workflows and opening up a path to HDR. Using Sony’s IP Live Production System, Studioworks is empowered to broadcast quality 4K and HD video, audio synchronisation signals and control data in real time over standard IP and network infrastructures. NEP Australia, the country’s leading provider of outside broadcast and studio solutions, has delivered the world’s first live-to-air, uncompressed high definition (HD) remote production using SMPTE 2110 in conjunction with FOX SPORTS, Australia’s leading sports broadcaster. FOX SPORTS broadcast of the Hyundai A-League match between Brisbane and Perth held at Brisbane’s Suncorp Stadium was produced and directed 920 kms away in Eveleigh (Sydney) using NEP’s new permanent centralised production facility, The Andrews Hub. Live uncompressed HD signals from 10 Sony HDC 4300 4K/HD cameras at the venue – including high frame rate cameras – were sent to Sydney via NEP’s new countrywide Distributed Production Network (DPN), with a fully redundant network at 50Gbs. Developed and published by Riot Games, ‘League of Legends’ has become one of the world’s most popular third-person multiplayer online battle arena games, attracting more than 100 million active players each month. This year the Brazilian finals took place l on September 2nd at the Mineirinho Arena to a live audience of approximately 8,000 and was also broadcast live on ESPN in Brazil. Audio supplier Gabisom were there to ensure the gamers aural experience would match the intensity of the final battles taking place, trusting DiGiCo as their weapon of choice. Gaining popularity since 2010, multiplayer online battle arena or ‘MOBA’ is currently one of the most widespread forms of game play and League of Legends is at the forefront of this, attracting thousands of eager gamers to the championships. The former mining district of Schladming-Dachstein is considered one of the finest skiing areas in Austria during their season. It is also famous for the Men's World Cup Night Slalom – hailed by some as the biggest party in the Alps – attracting up to 50,000 spectators and skiing enthusiasts annually towards the end of January. The pressure was therefore on for lighting designer Daniel Reistenhofer from D-TWO Stage&Light Creations who was asked for the first time to light the 2017 season opening event. To help make the biggest impact possible with his bold and vibrant lighting scheme he enlisted the help of over 100 Robe moving lights – 74 x Pointes and 34 x BMFL WashBeams! Daniel was asked to light the ski opening after the organisers, Leutgeb Entertainment Group and the Planai Hochwurzen Bahnen Gesellschafft, saw some of his other stage designs. They wanted something totally different to what had been done before. Lighting and video rental specialist Colour Sound Experiment has invested in new Robe MegaPointe moving lights, Blackmagic video control technology and new pre-rigged trusses, all of which is out on the current 2CELLOS tour playing arenas in key capital cities around Europe. West London based Colour Sound is providing lighting, video, rigging and crew, working closely with lighting designer Crt Birsa and production manager Chris Griffiths. The UK performance was a roof-raising extravaganza staged at London’s Royal Albert Hall with the band accompanied by The Royal Philharmonic Concert Orchestra. They played out some of 2CELLOS hugely dynamic repertoire which went from the decorum and refinement of assorted film scores to the raucous rock-out mayhem of AC/DC and the Rolling Stones covers. For this first two weeks of the tour in Siberia, they took a floor and specials lighting package which fitted into one truck together with the audio gear. When they reached Riga, another truck was added carrying the full top lighting package and additional sound. The full production then continued until the end of the tour, another five weeks around Europe concluding with two highly memorable UK shows in London and Manchester. Matt was joined on the road by a Colour Sound crew of Sam Kenyon (chief), Jonnie Westell and Liam Rudd. Sam and Jonnie did the whole tour including the first two weeks and were joined by Liam in Helsinki as they ramped up to the full rig. British 'virtual band' Gorillaz have headed out on their much anticipated worldwide Humanz tour with a bigger than ever light and video experience. Delivering the tour's sophisticated light show is lighting designer Matt Pitman who this year has expanded his rig to include the Claypaky Mythos2. Having worked with Gorillaz for a year, Pitman is experienced in delivering shows sensitive to the band's large projection element. This year the designer wanted a workhorse lighting fixture that not only delivered on power output but also provided sophisticated colour palettes to complement the on-screen animation, developed by award-winning comic artist Jamie Hewlett. Panasonic initially provided RTS with the AJ-PX 270 Micro P2 to test along with models from competing brands, to replace their ageing equipment. The field reporters on the RTS editorial team had been using the same camcorders for six years, so when it came time to replace them three years ago, the network launched its first call for bids. With the arrival of 4K technology however, RTS wanted to turn to more advanced and future-proof products. With this shift in focus, the procurement process was relaunched and new products were tested, including Panasonic’s AG-UX180 camcorder, which was ultimately selected. In live production and live streaming area HyperDecks are widely used for recording different camera angles. Using HyperSlow one can create a slow-motion system built from up to 4 Hyperdecks. HyperSlow for iOS is able to control 4 HyperDecks and supports functions like record, playback with different speeds and tagging. A “SuperPlay” function allows playing back a scene in slow motion from different camera angles one after the other. New in version 2 is a tight integration of ATEM switchers. When using the “SuperPlay” function, HyperSlow can take over the control of the ATEM and switch program to the right HyperDeck at the correct time, as well as control performance of stinger and other transformations. The number of “event keys” for tagging important moments in an event has been increased from 4 to 6. Costs reduction, no quality compromise, increased productivity and flexibility for repurposing are the challenges faced more and more by TV production companies nowadays. Getting this message from key customers and with this aim in mind BLT went on to extend its ecosystem of products and software applications to fulfill these requirements. In last few years, live TV productions for sports and entertainment shows leveraged the increased number of viewpoints and camera feeds to get the audience more involved. This led to a significant increase in the number of hours of raw material produced: any frame could be useful in the creation of another remarkable storytelling. Telegenic and BT Sport gave Broadcast RF the opportunity to put the Vislink HCAM system through its paces at a Women's Super League match at the Kingsmeadow Stadium, London, on Sunday 7th January 2018. The HCAM systems were also used on an Arena TV OB to capture live coverage from an English Premier League match between Everton and Tottenham Hotspur at Wembley Stadium this past weekend. This news follows a previous announcement made on Dec. 29, 2017 that BRF had taken delivery of the first HCAM systems. BRF is a leading hire company for microwave and wireless camera hardware, and has been a long-time deployment partner of Vislink in the UK. They are currently the largest single holder of HCAM systems in the world, with 28 systems purchased. Ikegami introduced its UHK-430 camera, the world’s first camera with the ability to output an uncompressed 4:4:4 resolution RGB transmission of a 4K video signal. Designed for use in the studio and on location, Ikegami’s UHK-430 features three 2/3-inch 4K CMOS sensors and RGB prism optics. Equipped with the new AXII ASIC chip for low power consumption and new processing features, the UHK-430 is capable of 40 Gbps transmission using standard SMPTE hybrid fibre camera cable. Along with the ability to transmit an uncompressed 4:4:4 4K video signal, it also boasts the capability to transmit eight HD channels from CCU to camera, including multiple return video and two HD prompter video channels, plus one HD trunk channel from camera to CCU, allowing for greater flexibility. ATP Media, the broadcast arm of the ATP World Tour carried out a live 4K v 1080p HDR test at the Nitto ATP Finals, the season ending finale held in November 2017 at The O2, London. The test was designed to see side-by-side, the two production formats in a live tennis environment, as part of ATP Media’s commitment to trialling the latest technologies to advance its broadcast offering. The ATP Media and Gearhouse team were able to combine the Sapphire HEVC system seamlessly with the main production, with all the outputs coming from one desk and one Director’s cut. This allowed them to compare their existing 1080i output with 4K SDR, 4K HDR and 1080p HDR. ATP Media were therefore able to see exactly how the formats compare. Shanghai Media Tech runs the full gamut of production activities: pre-production, broadcast, post-production, network operation and maintenance, application development of new media and more. To match its breadth and depth of services, the China-based media company chose Grass Valley, a Belden Brand, to provide a fully comprehensive, total 4K/IP solution for its OB van and EFP systems. Shanghai Media Tech’s mobile production units are equipped for any live program or sports event as Asia’s largest all IP, 4K UHD OB vans. Each OB van and EFP system is outfitted with multiple LDX 86NHigh Frame Rate/HD/3G/4K Software Upgradable Camera Platforms, Kayenne Video Production Center, GV Korona K-Frame V-series, GV Node Real Time IP Processing and Routing Platform, IPG-3901 Densité IP Gateway and GV Convergent IP/SDI Router Control & Configuration System.